It is never a particularly good idea to marry a Happy Ending to a rash of loose ends, but the result that the director duo of Raj Nidimoru and Krishna DK extract from this quirky and risky exercise is none-too-unhappy. I strongly recommend you watch it, because it’s dollops of happy whoopee. Average fare, but an extra half-star for inventive dialogues; for reminding us that his timing is intact, if only just. Happy Ending, the unique and refreshing satirical romcom, is definitely a good watch this week. It is a decent movie with adequate entertainment quotient and is good for a single watch. Govinda as a commercially prone actor is brilliant. Despite all its references to screenwriting, Happy Ending feels like a first draft. Happy Ending can hold your attention throughout its length except some not-so-necessary intimate scenes. There is enough in the story to provide you a good dose of entertainment, you just don’t need to expect too much. Happy Ending takes a dig at stereotypical Bollywood romantic comedies, yet keeps the ending realistic. Ileana and Saif’s chemistry is delightful and brilliant. The movie is filled with endearing scenes. Also, watch out for Kareena Kapoor and Preity Zinta in cameo roles! If you wish to walk out of the cinema with a smile on your face, Happy Ending should be on your ‘to-watch list’ for the weekend. The film is a funny take on modern day relationships. 'Happy Ending' is a light-hearted comedy about rom-coms. Despite being a bona fide romantic comedy, the film goes beyond it. Wrapping Hollywood ribbons on a Bollywood heart, this is a nice ending - and a good start. Overall, Happy Ending has nothing new to offer except a few funny scenes, dialogues, songs and exotic locations. 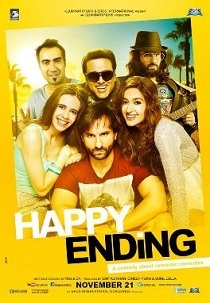 Happy Ending is a mashup of Saif AIi Khan's popular films. A lovingly welcome breeze of tease on Btown romcom (romedy as we all say). Illuminati Films and Eros International’s comedy about romantic comedies oozes with confidence, smartness, wittiness and knock out performances.